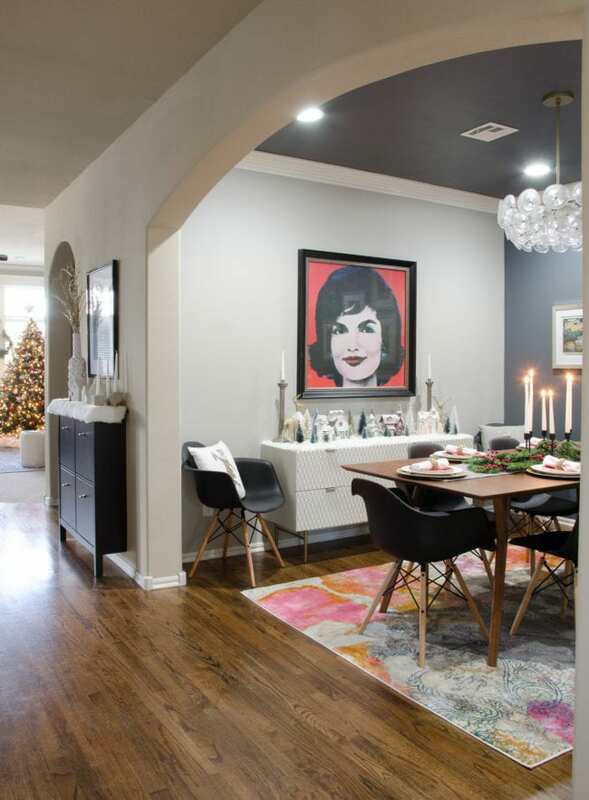 Our new dining room decor mixes my modern glam style with some more casual mid-century furniture to create a room that is welcoming for all ages! This post is a great two-for-the-price of one. 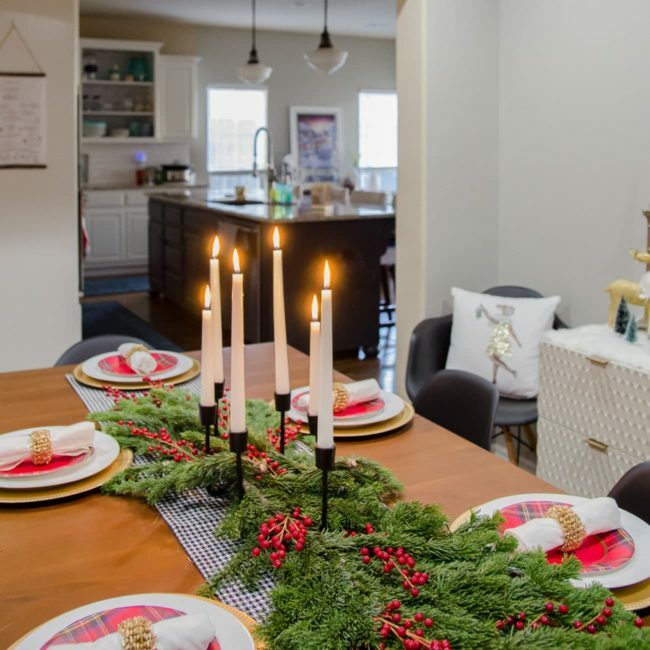 I get to show you how our dining room makeover turned out AND how I decorated the brand new space for Christmas! 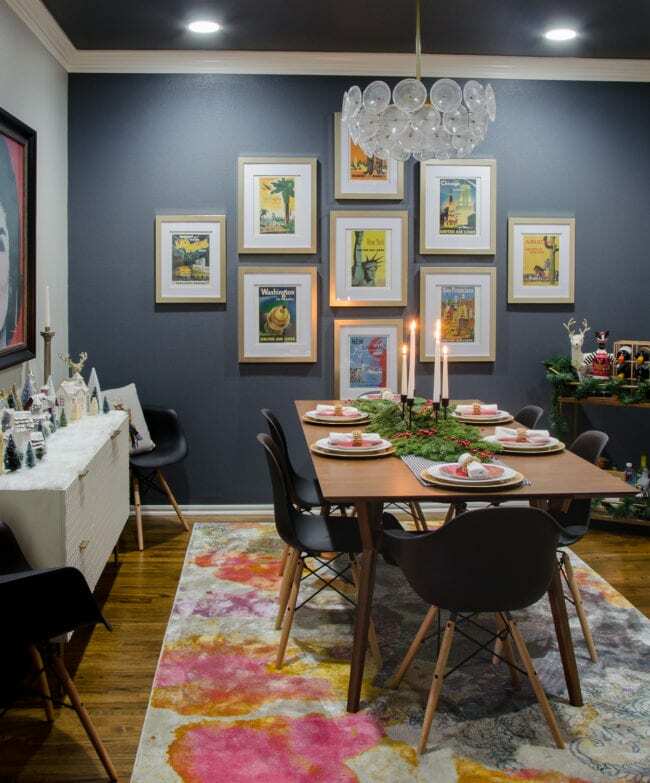 To recap for any new readers, or those that don’t get the newsletter (you should – sign up here), decorating our dining room has been on my dream list for YEARS. Since we moved to this house 5 years ago, the space has been a hodge-podge of our old table and a storage unit that we accidentally bought in the wrong color at IKEA 4 years ago. It’s a good 8 hours round-trip to IKEA, so we opted to keep it, but it was a reminder of our mistake and that it was never what I planned. As we’ve been transforming other rooms into spaces that really reflect us, the dining room was starting to stand out more and more. Jackie was awesome, but I was ready for the rest to move on. Frankly, we didn’t have the budget to tackle it this year. THEN the most amazing thing happened! 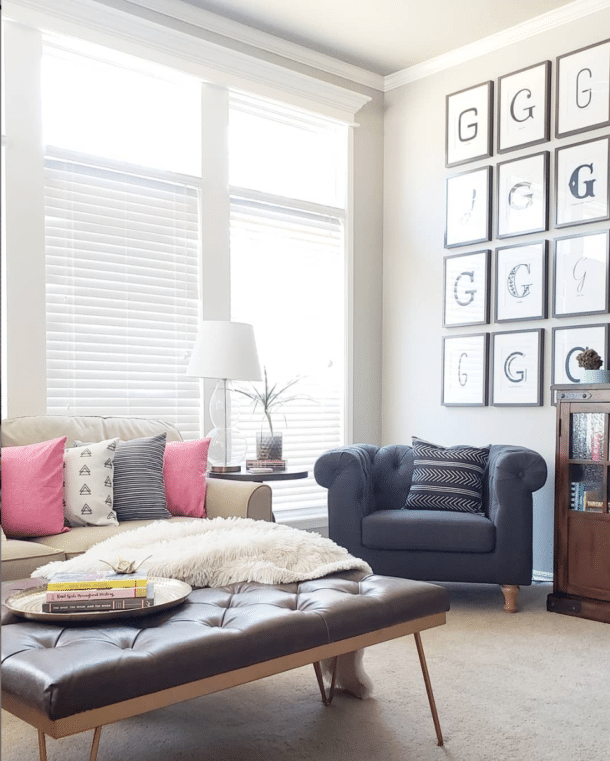 I saw a friend share a decor restaging photo contest by RE/MAX on Instagram with a grand prize of a $2000 West Elm gift card. The theme for the week was entryways. I needed to update the staging of a cart by our front door anyway, so I worked on that and came up with a creative view of the entry from our upstairs. I was happy with the photo (see it here), but I was still shocked to find out that I WON! 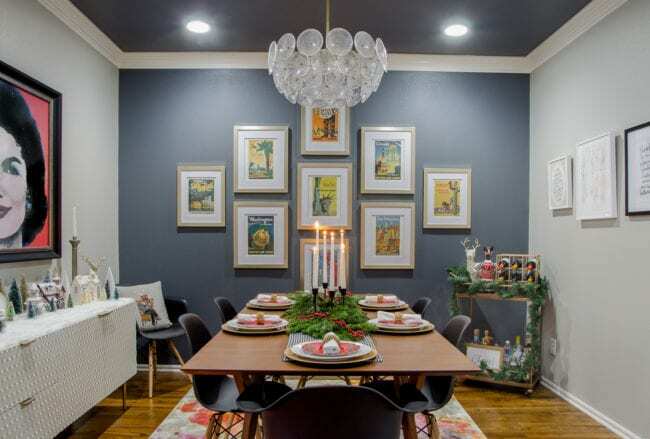 So, this post isn’t sponsored by anyone and the contest was open to everyone, but the prize covered the cost of a new dining room table, buffet, and most of the cost of the light fixture thanks to some great sales. We bought everything else, so sticking with frugal options was key since I didn’t plan to do the dining room this year. To help cover the costs, I sold the old chandelier & mirror at a garage sale. The table is still for sale if anyone local is interested. It’s gorgeous and well-loved, just not our current style. Okay, enough back-story, here’s how the dining room looks now! The full source list is at the end of the post. On the right wall, we’ll add some floating shelves for glassware after the first of the year. 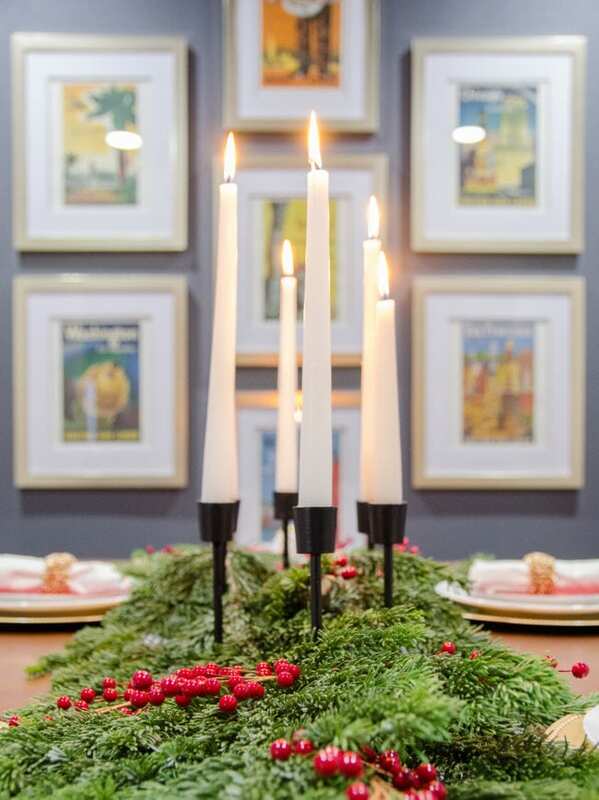 I had winter art from this post, so we opted to use it for now and save ourselves the rush of trekking to IKEA for shelves before Christmas. I’m most obsessed with the buffet, accent wall/ceiling color, and new chandelier. 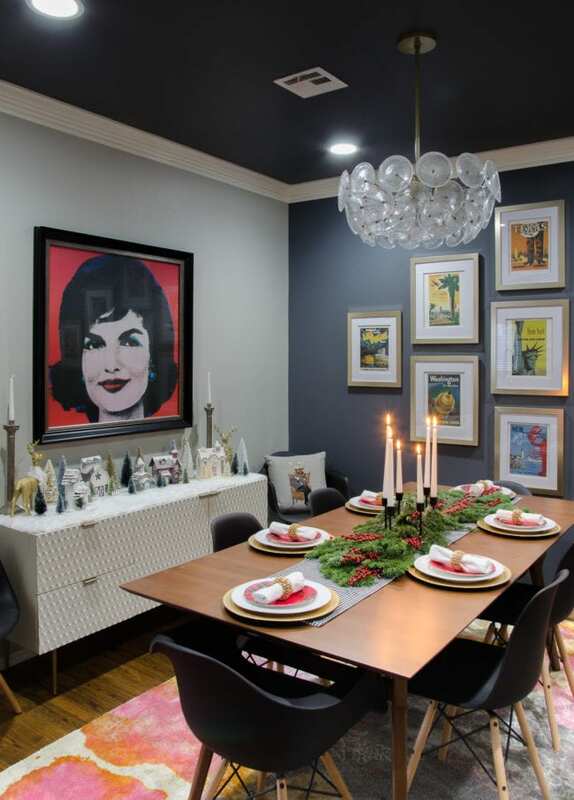 I was really torn on how to design the room, because I love many of the more formal modern glam dining rooms I’ve seen lately. But, I also wanted it to be a room that welcomed everyone, including all of our young nieces and nephews. I love the balance between the chic lighting & buffet, but more casual table & wipeable chairs. The art on the back wall is all from a travel poster calendar we have been saving to frame since 2007. It took ten years to find the right project, but I love finally having them on display AND that I didn’t have to buy art for this big wall. While we’re on this point of view, I’ve been looking for new lighting for the dining room for YEARS! Not only was the old chandelier not our style, it was shocking how often we hit our heads on it. Since I had the mid-century table and chairs going on, I wanted something with a little more glam flare in the lighting department for balance. 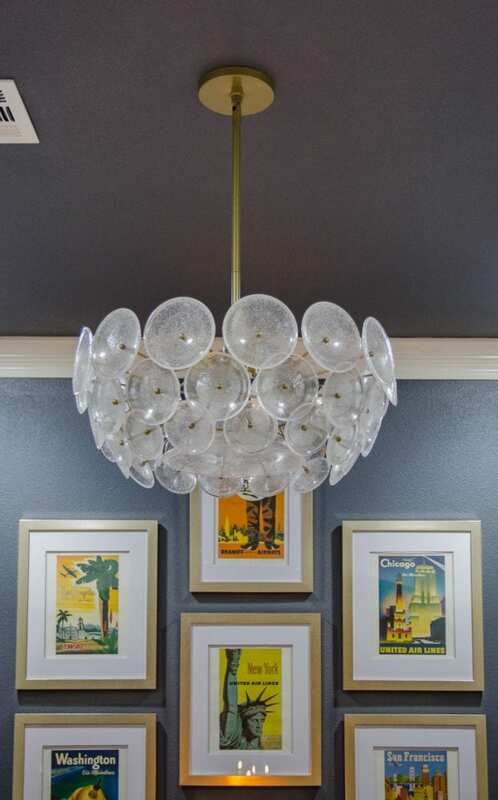 And we found the perfect answer with the glass disc chandelier! You may have noticed that we flipped the direction of the table from the old space. Making the 90-degree turn let us put the new buffet under Jackie. Now the buffet is easy to access and we can keep the table expanded to 80 inches all the time. When we have more than 6 people, the 2 armchairs from the corners by the buffet can cozy right up to the table between the armless chairs on the sides. I would have a table for 20 if it would fit, so adding two additional seats from what we had before makes me very happy. 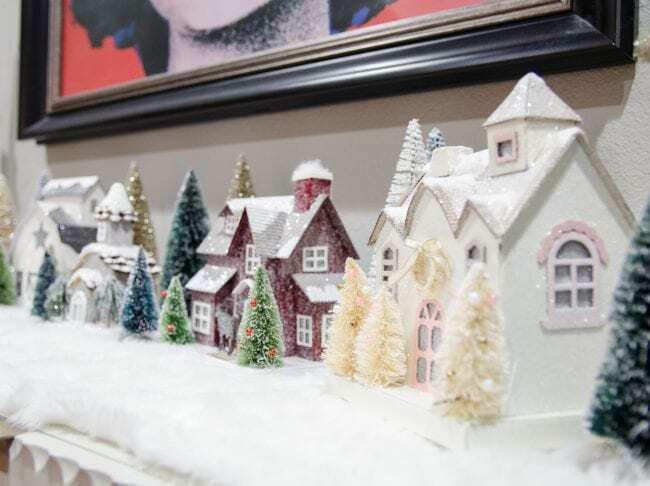 I planned on using the buffet top as an extra serving station for holiday entertaining, but then we started unpacking Christmas decor, I realized it was the perfect spot for my newish sparkly Christmas houses. I kept finding them on huge sale and even post-Christmas 80% off clearance last year! They make me smile and I couldn’t leave them behind. I took Rachael’s money-saving tablescape advice and re-used things I owned for the place settings. The only new item I needed was red plates. The first ones I found were $14.99 each, so even with a 50% sale, it would have been $45 for the 6 small plates I needed. Yikes! Instead, I found some cute (and cheap) plaid paper plates. Score! Some links to the products we used in the room are affiliate links, so if you purchase after clicking the link, I may get a small referral fee. You always pay the same price. Win-win! Buffet – Heads up, this isn’t a pure white. It’s a nice color, but just be aware you don’t want it next to anything pure white. Here’s one last look – this is the view I see of the dining room from the kitchen now. We’ll still get the shelves up in the spring and this rug may go up to the guest room if I can find something I like better. Maybe houndstooth!?! 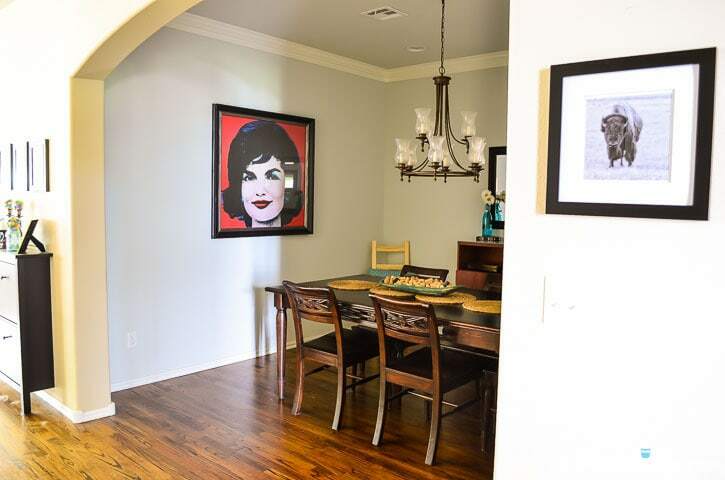 Either way, it’s so awesome the dining room is a better match to the rest of the house now! Although, the real lesson is here is not to be afraid to enter a contest and work hard at it – you may win! Goodness I absolutely love that back wall and chandelier!!! 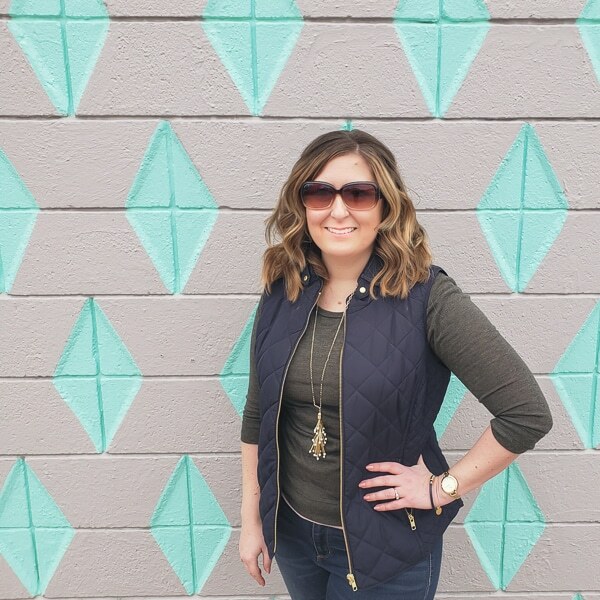 Gorgeous choices and perfectly put together! Thank you, Lisa! Such a relief that it’s a happy space now! Well done, you! Such a lovely space. Love the chairs, talk about practical! 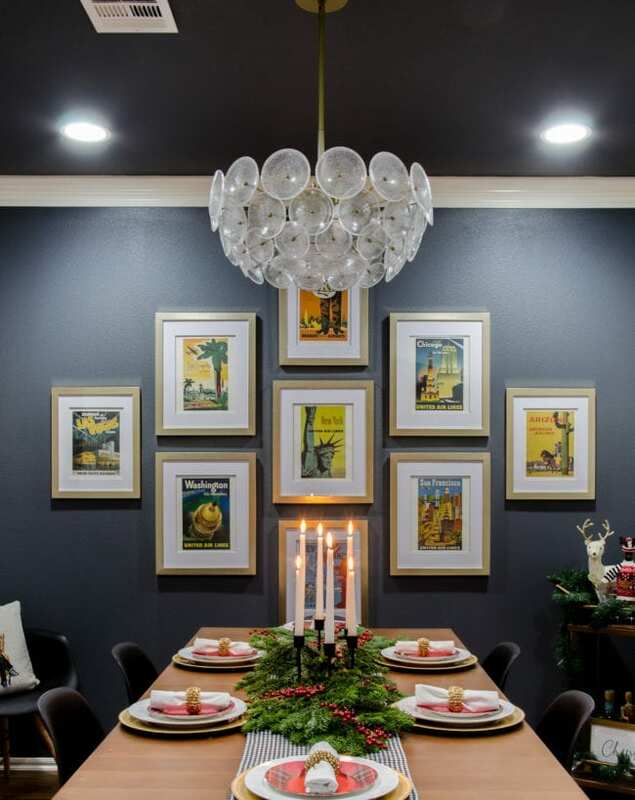 Everything looks good, bold statements and moody colors and mood setting lights. Great job. Your dining room doesn’t have a window? Thanks Deb! I love that we could mix the practical elements with some moodiness so its great for kiddos or adults depending on the occasion. You’re right about it not having any windows, it’s right in the center of the house, which is convienent, but it’s definitely dark when the lights are off. Yay! I love it, especially the table, chairs and Jackie. 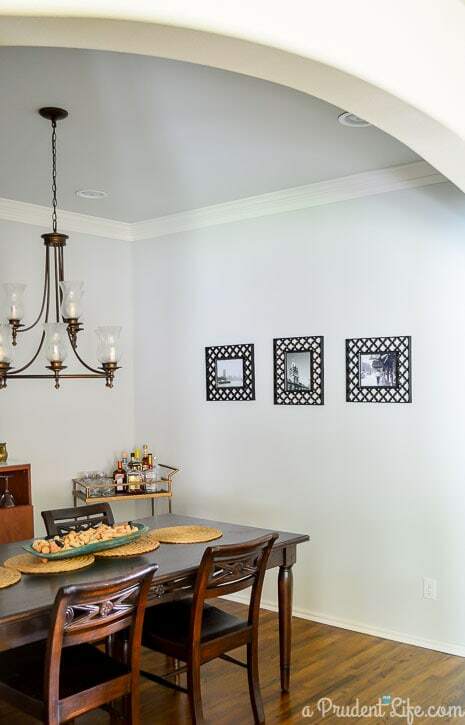 I also love how it calls out style-wise to your breakfast nook area too. Nice work! Thank you! 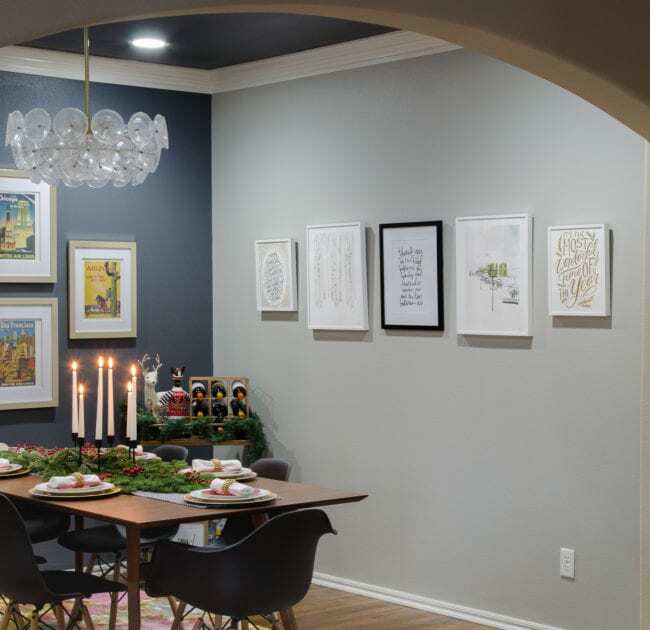 I totally agree with the nook comment and it’s nice to finally have the dining room tied to something style-wise. It was a sad island before. PS: Have fun and sell lots of stuff tomorrow! Ah, thank you so much! Depending on the day, I love or hate the rug. It’s a little shiny in person, but I do love that it’s bold and I never would have been brave enough to pick it a few years ago. If your chandelier had glass shades like mine did, you might see if they are removable. I had taken ours off about 6 months ago and it was a great change to give me more patience until I found the perfect option. Melissa! You did it again!!!! That first picture of the new space…”WHOA! !” The contrast between the “before and after” is amazing! Love, love, love the furniture, chandelier, and oh, my, that rug is INCREDIBLE. I agree with the comment above, it ties it all together. Made for that space. I know you are going to make so many family memories there in the years to come! Thank you! We had the great luck of my Granny, Aunt & Uncle being in town last week, so our first meal in the new space was nine of us around the new table. It was fabulous! It looks amazing! I love that new wall color and the art gallery and that chandy! Oh my!